I was invited to be part of a team dinner before our big meeting the next day. There were about about twenty of us from all around the globe, and it was good to spend some quality time catching up. What was also good was the dining place of choice for tonight, Archipelago in Burlingame, San Francisco. 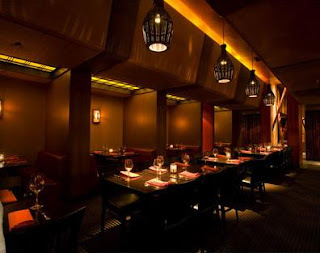 This restaurant aims to provide a distinctive European-Asian cuisine accented by sensual design elements. They claim to have brought together elements of French and Spanish cuisine inspired by the flavors of the Philippines. Burlingame is very close to the San Francisco International airport. If you are in one of the hotels near the airport, this is a great place to try out. On this day, I was planning to have a relatively lighter meal, and therefore chose fish and veggies. 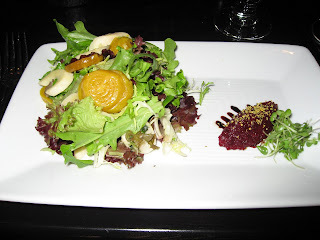 From their interesting selection of small plates, I ordered the Fresh Hearts of Palm & Roasted Beet Salad that contained olives, balsamic reduction and greens. It was interesting, but not as much as their popular Quartet of Hot and Cold Oysters served with lemongrass mignonette and a spicy mango chutney. Need to definitely order that the next time! 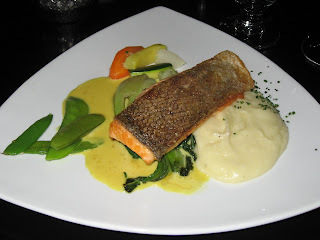 My 'healthy' entree was the Salmon fillet served with mashed potatoes and butter beans. While the entree was perfectly done, there were other meat dishes my fellow diners ordered that looked like even better choices at this restaurant. The Spice Perfumed Slow Braised Short Ribs was one. With coconut cream risotto, sauteed brocollini, Asian peppercorn jus, beans and carrot. Another was the Pepper Crusted Half Lamb Rack that came with sauteed forest mushrooms and baby carrots. My dessert of the Duo of Cream Brulee - Vietnamese Coffee and Hazelnut - was a fitting end to this wonderful meal, made even more unforgettable by the company of colleagues from far-flung places. While I was with a large group, this restaurant is the perfect setting for a romantic dinner for two. 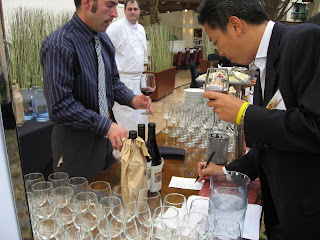 During the two days of the global leadership meeting, I was invited to two different wine-tasting receptions. While I don't know my wines as well as I do my food, it was fun to taste a variety of different wines and take baby steps towards understanding their subtle differences. 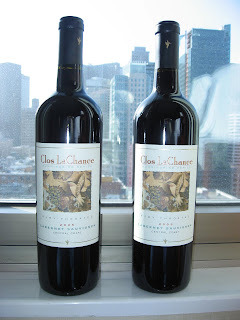 One of the wine tasting events was from by a local winery, Clos La Chance, that began in a techie's garage in Silicon Valley (how fitting!). There was a game of guessing the mystery wine, and while my team didn't win, my colleagues from the winning team graciously gifted me the wine bottles they won: ruby-throated Cabernet Sauvignon. The other wine-tasting was at the Los Gatos home of my boss, who also happens to own a vineyard in New Zealand. Here we tasted the wine from his vineyards in addition to others. This was fun! Can't wait to go on holidays, and have my first sip! I'M not a big fan of wine... weird for a French, I know! 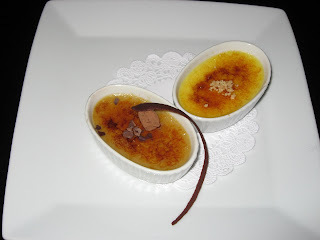 Wine and creme brulee? Oooh la la! Seriously, how jealous am I right now - looks delish! @zhu: Really, no wine for you? Wow! Re: burned cream, ah...so that's what it means in French! Must come to Africa.... let me know when u're around Ghana.